Tone 4 holds the energy of Stability. We are grounded with a sense of orientation. This is exactly what we need to get our new bearings from the last Ascension. After the CIMI trecena of Transformation and Change, we are in a major adjustment to the New. The hurricanes tell such a story. We awaited their landfall of change, and now those in its path are dealing with the new reality. What we see as total disaster has the potential to be Humanity’s Highest Accomplishment. Just as they are now “pushing through,” so must we continue onward to serve Our Highest Purpose. Wind/IK symbolizes the Breath of Spirit and the Breath of Life. The Creator can speak to us through the Wind. The portals carved in stone were created to magnify the sound and vibration of the Creator’s Voice. As we face greater challenges, we will have the Wind at our Back. Though the next summit still looks far away, we have an Unseen Force blowing the Breath of Spirit to magnify our momentum. Now is a time to anchor our Intention to clarify our orientation and direction. We can call on the Ancestors to Intervene on our Behalf. We can continue to call until we are given the strength of Renewal. The energy has been a little bumpy here and the truth of reality a little hard to take. These are days when I seem to loose the presence to look within, and seek high and low for third-party input. I couldn’t find it anywhere in the written word, but found it through a Dear Friend – just being there. Now the people standing together are waiting for help, food, and water. They are pushing through. We just went through a cycle of Major Life Change. We are stronger than we were before. 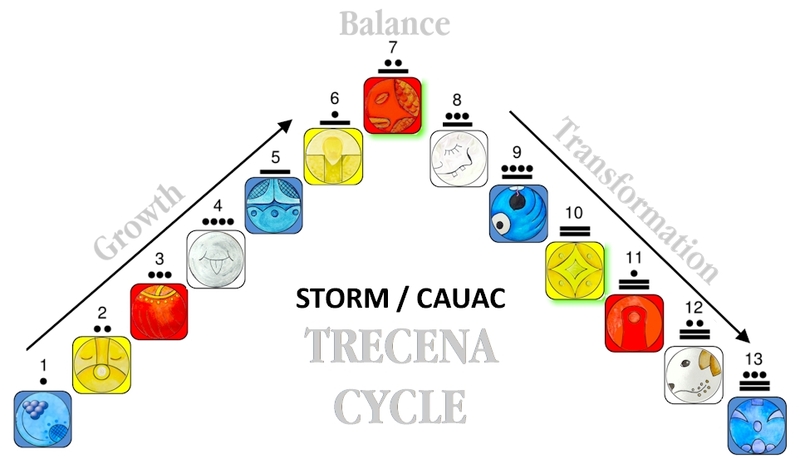 The Storm/CAUAC trecena has the power to change the landscape. The dead branches blown, make way for Deeper and Higher Growth. As a White Day Sign of the North, Wind/IK resides in the place of our Ancestors and the Wisdom of their Experience. This is a day to look for a Discernment of Spirit. The traditional teaching about the Wind is to notice thoughts and situations, when the Wind catches your attention. Wind/IK is said to hold the energy of an inquiring mind. Those who were born under the Destiny Sign of Wind are Dreamers and Planners who employ the Power of their Imagination. Wisdom can be drawn from Experience whether Real or Imagined. To all my relations, may we ground ourselves with Faith in our Ascension. May we recognize that what once seemed hard can be managed easily by just holding Faith in CAUAC’s Wisdom of Regeneration. May we use all the Spiritual Tools we are given to live in Gratitude for our Blessings.